Romelu Lukaku and Ander Herrera's goals snatched slapdash Manchester United a 2-2 Premier League draw at Southampton. Marcus Rashford set up two goals in six minutes, to make amends for conceding the free-kick that let Southampton take a 2-0 lead. Adam Armstrong drilled his third goal in two games to give Saints a surprise lead, before Cedric Soares curled home a stunning free-kick. England forward Rashford upended Mario Lemina for the foul that let Cedric double Saints' lead - only to roll up his sleeves and drag United back level with two assists. 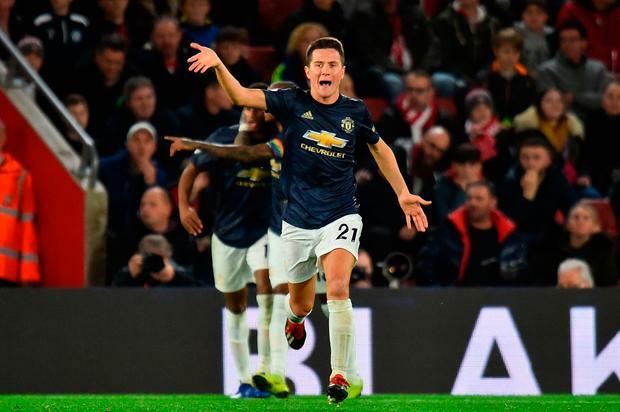 Lukaku ended a six-game drought in all competitions before Herrera flicked home the equaliser, to leave Southampton boss Mark Hughes still under huge pressure. United escaped a fifth defeat in their 14 league games, but were unable to avoid a fourth draw. Saints meanwhile remain rooted in the relegation mire, with their winless top flight run stretching to 10 games. Lukaku wasted a decent early opening, blasting straight at the onrushing Alex McCarthy after the Saints goalkeeper had swiped and missed with an attempted clearance. Rashford's smart backheel not only kept the ball in play but also teed up Lukaku - but the Belgium striker could not slot home. Saints took that reprieve and sprung to life, with Armstrong rifling the opener courtesy of a neat tee-up from full-debutant Michael Obafemi. Rashford then helped set up Saints' second, his scything challenge on Lemina drawing both a yellow card and a free-kick well in range of United's goal. Portugal defender Cedric duly stepped up and whipped a fine effort past a stunned David De Gea, to double the home lead. Rashford set about securing recompense, and laying on two goals in six minutes went some way to footing the bill. The England forward's smart centre gave Lukaku the chance to hammer home - and the United target man did exactly that. And in next to no time Rashford conjured another byline cutback to invite Herrera into a fine backheel finish. Just like that, United were level, and walking into the changing rooms wondering how they had ever slipped behind - and no doubt to receive some stern words from boss Mourinho. United failed to up the ante after the interval, and Scott McTominay was fortunate to escape a heavy challenge on Obafemi without conceding a penalty. United's inability to dominate despite hauling themselves back into the contest was laid bare by the visitors setting up two banks of four time and again throughout the second half. That Saints pressed without sufficient accuracy or incision matters not, for any United side, and any Mourinho team, ought to swat aside the likes of the struggling Saints. Armstrong nodded just wide from Redmond's drilled corner, and that after Paul Pogba capped another quizzically inconsistent showing by passing straight to the hosts. Though United pressed again at the end, Saints held out, leaving neither side happy and both pondering troublesome form.